Picture is for reference only and may contain options or accessories that are not included. 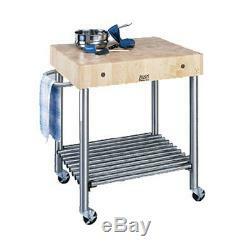 John Boos, CUCD15, Cucina D'Amico Butcher Block unit 24"W x 30"L x 35H. DUE TO HIGH DEMAND PLEASE CALL TO CHECK STOCK AVAILABILITY PRIOR TO ORDER. This John Boos CUCD15 Cucina D'Amico butcher block unit features an sturdy 5 thick edge grain hard rock maple top that is finished with penetrating oil. This unit comes with food service quality stainless steel legs, towel bar and undershelf that are composed of type 18/304 stainless steel with a #3 satin finish polish. The middle shelf is reversible. A set of commercial grade 3 locking casters are included. 5 Thick End Grain Hard Rock Maple Top. Food Service Stainless Steel Legs, Undershelf and Towel Bar. Type 18/304 stainless steel # 3 polish, satin finish. Commercial Grade 3 Locking Casters. Top: Edge Grain Hard Rock Maple. Shelf: 18 gauge type 304 stainless steel, #3 polish, satin finish. Legs: 18 gauge type 304 stainless steel, #3 polish, satin finish. Most warranties are not valid if used at a non-commercial address. WARNING: This product may contain chemicals which are known to the state of California to cause cancer, birth defects or other reproductive harm. Inspect the outside of the packaging to look for dents or crushed corners. If you see anything even slightly suspicious carefully remove all packaging and inspect the item. The driver may be impatient but that beats having to settle for a damaged item. What if my item is damaged? This is often the best option if you need to get your item operational and the damage is cosmetic. The item "John Boos CUCD15 Cucina D'Amico Butcher Block unit 24W x 30L x 35H" is in sale since Wednesday, September 21, 2016. This item is in the category "Business & Industrial\Restaurant & Food Service\Commercial Kitchen Equipment\Food Preparation Equipment\Prep Tables". The seller is "dougequip" and is located in Bluefield, West Virginia. This item can be shipped to United States.